Last month we brought Teen Slasher back for it’s 8th season. This time Teen Slasher took the Rocklin audience to space! Lots of murder, mayhem, and laughs ensued. I had a chance to sit down with the cast and ask them some questions about the performance, preparation, and favorite moments. A lot of work goes into this improvised genre comedy! If you would like to see some pictures and videos from the show be sure to check out our Instagram. What was your favorite kill during Teen Slasher? Kevin: It wasn't really a kill, but Troy's character during the first show was badly injured. He wasn't dead, so he crawled onto the stage, dragging himself across, and did it several time during the show and it killed me each time. Dustin: My favorite kill during teen slasher was a failed kill. Troys character was almost killed but never died and kept coming back crawling and dragging himself across stage. It was such a fun bit. Troy: In rehearsal we had an alien that would just make people explode. So we had fun just bringing on random characters that would just be there to explode. Sydney: Oh, well during one of our rehearsals someone killed a monster with a giant condom. Which has been your favorite character to perform and why? Kevin: While I wasn't a character this year, but I have done it in the past. I remember playing Chad, a jock, which was different for me since I am such a nerdy person in real life. It was a lot of fun to emulate that kind of person and confidence. Dustin: My favorite character to play was Jays son that turned evil. It was a lot of fun playing with the transformation of the kid as he turned bad. I had a blast playing with the voice bouncing back and forth between sweet and innocent to possessed and evil. Jay: Les Talent was a joy. I rarely play villains or jerks, so playing an egomaniacal space captain on the verge of a psychotic break was a nice change of pace. Les ended up being the killer in that particular show, so I had the chance to get out of my comfort zone with a character. had them before. He had to make a choice to lose emotions and live or just die. It was interesting to see how that character felt about himself and other people after the incident that left him emotionless. Sydney: I have one character and he is a very old man. He's fun, cause he's sassy and usually has a storied past. Tips for anyone looking to use fake blood? Kevin: If you get in on your clothes, make sure to NOT dry it in the dryer until the stain is completely gone. If you are not careful, the dryer can heat press the stain and it will never come out. Also, avoid getting it in your mouth. Dustin: Tips for using fake blood would be practice using it lots before the show. I would also recommend finding fun ways to deliver the fake blood. My favorite was the water gun filled with fake blood. Jay: There are numerous types/brands of fake blood. Understand how yours works. If you’re spilling it (as opposed to using it as costume makeup), practice with it and understand how it sprays, whether it stains, etc. Troy: Practice Practice Practice. Know your blood capabilities and limitations. Have fun! Sydney: Either take careful precaution and... post-caution (? ), or just be prepared to have everything covered in blood for the rest of all time. What surprised you during your run of Teen Slasher? Kevin: The biggest surprise is was how quickly the cast was able to come together and put on an amazing show. We had less than 20 days from our first rehearsal to our first show. They all worked so hard and showed real passion. 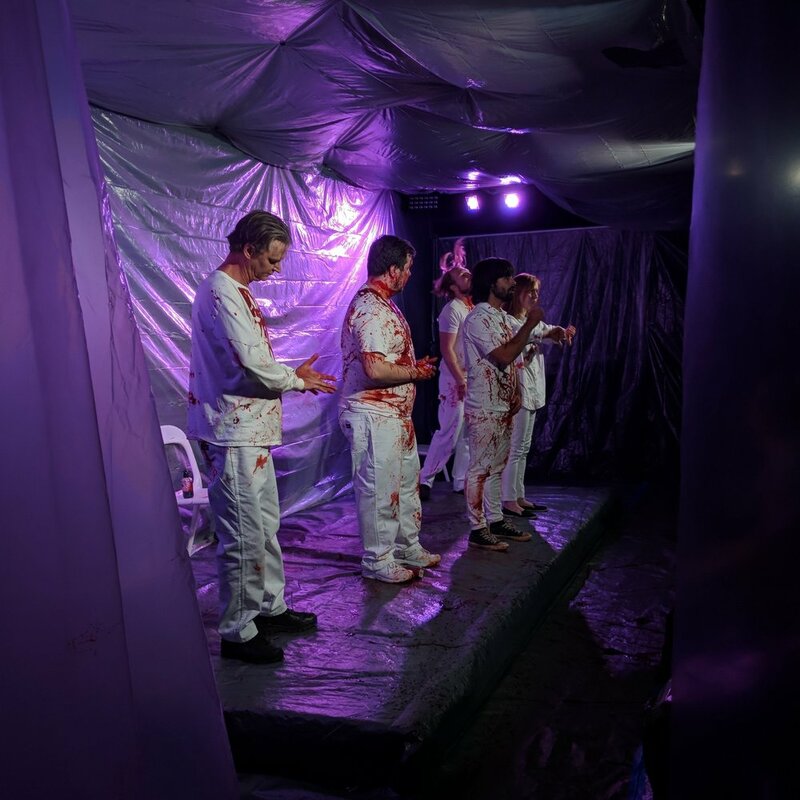 Dustin: What surprised me the most was how slippery the stage got with the fake blood. At moments I felt like a was doing blood ice capades. Jay: No matter how many times I perform in Teen Slasher (this is my 6th year), the audience turnout never ceases to amaze me. Despite loving the genre, seeing full houses for every show was a huge surprise. Maybe October just gets people in the mood to see some bloodshed. Troy: Putting the Teen Slasher Genre into space was a more challenging than I thought it would be. There were many ways to introduce a "killer". Rogue Alien on board. Or some biological mishap that changed crew members. With no defined killer the story line could get a little confusing. Sydney: If you buy white pants from a thrift store, about 90% of what you find will be 10+ years old. What's one tip you would give another improviser interested in genre work? Kevin: I would say there is a very delicate balance when doing genre work. It takes both researching the genre and experimentation. You need to be both truthful to the source material but also make it your own. Dustin: Genre work is a lot of fun. I would recommend anyone interested in working on genre work start by watching and researching the genre they want to perform. Make the plot simple and easy to follow. Focus most on the characters and relationship in the story they are most important. Jay: First, make sure you understand how to tell a story. Being a good storyteller will make any genre show easier. Second, understand your genre. Read it, watch it and absorb it as much as you can. Recognizing the tropes that pop up in your chosen genre means you can take utilize them to tell your story well. Troy: Focus on characters not plot. Keep it simple. Foreshadowing can be really fun. Example: setting up rooms with weapons or different ways someone could die. Then using those things later in the show. Sydney: Do your research! Genre work is the same as anything else really, you just have to know what you're drawing from.